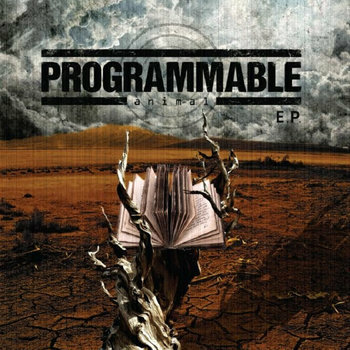 Two Guys Metal Reviews: Programmable Animal - E.P. It takes a certain level of... I don't even know what to name your EP E.P. That being said - it's certainly an effective title! The wide open vocals and powerful soundscapes found here draw you into a unique musical universe that simply speaks to the mastery of Programmable Animal as artists. They have crafted their own sonic world an the more you spin their new record the deeper you find yourself lost within. Herein lies a band with a distinct vision and a strange overall approach, one that will, if nothing else, capture the imagination. The strange droning vocal lines that introduce I Close My Eyes immediately generate intrigue. They evolve into something much more poignant by the end of the record, but it makes for some very intense listening. The rising waves of sound (For sound bites and guitar effects are crucial to this record) help to create a veritable wall that comes crashing down on the listener. The undercurrent of gentle guitar lines that are directly contrasted by far more brutal and terrifying moments is difficult to wrap your head around. There is a certain sense of fatalism that seems to give this album a sense of destiny, as the albums last track - The Book Of R's wraps up you find your journey complete, you have returned home. Programmable Animal know what it takes to craft some truly fascinating sounds. There is a level of intrigue and sublime intellectual diversity that helps to make E.P. so interesting to me. The depth of the production means that you can spin this record time and time again and still find new things to explore in these immaculate worlds. This is a band who capture your imagination and paint incredible images as you close your eyes and fall into a strangely magical world - a place of freedom and technical ecstasy.